Henrietta Maria of France (French: Henriette Marie; 25 November  1609 – 10 September 1669) was queen consort of England, Scotland, and Ireland as the wife of King Charles I. She was mother of his two immediate successors, Charles II and James II and VII. 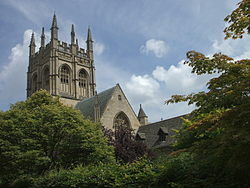 Her Roman Catholicism made her unpopular in England,  and also prohibited her from being crowned in a Church of England service; therefore she never had a coronation. She began to immerse herself in national affairs as civil war loomed on the horizon, and was compelled to seek refuge in France in 1644, following the birth of her youngest daughter, Henrietta, during the height of the First English Civil War. The execution of King Charles in 1649 left her impoverished. She settled in Paris, and then returned to England after the Restoration of her eldest son, Charles, to the throne. 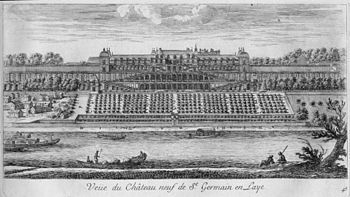 In 1665, she moved back to Paris, where she died four years later. Henrietta Maria had brought a large and expensive retinue with her from France, all Catholic, primarily her principal lady-in-waiting and confidant Madame St. George. Charles blamed the poor start to his marriage on this French entourage. Charles finally had them dismissed from the court on 26 June 1626. Henrietta Maria was greatly upset, and initially some – including the Bishop of Mendes – refused to leave, citing his orders from the French King. In the end, Charles had to deploy armed guards to physically eject them. Despite Charles's orders, however, Henrietta Maria managed to retain seven of her French staff  including her chaplain and confessor, Robert Phillip. By 1641, an alliance of Parliamentarians under John Pym had begun to place increasing pressure on King Charles, himself embattled after the failure of several wars. The Parliamentary faction achieved the arrest and subsequent execution of the king's advisers, Archbishop William Laud and Thomas Wentworth, Earl of Strafford. Pym then turned his attention to Henrietta Maria as a way of placing further pressure on Charles. The Grand Remonstrance passed by Parliament at the end of 1641, for example, did not mention the Queen by name, but it was clear to all that she was part of the Roman Catholic conspiracy the remonstrance referred to and condemned. Henrietta Maria's confidant Henry Jermyn, who had himself converted to Catholicism in the 1630s, was forced to flee to the Continent after the First Army Plot of 1641. The situation was steadily moving towards open war, and in February Henrietta Maria left for the Hague, both for her own safety and to attempt to defuse public tensions about her Catholicism and her closeness to the King. The Hague was the seat of Henrietta's prospective son-in-law, William II of Orange, and the queen was to accompany the bride, her 10-year-old daughter Mary, to her new home. Also, her widowed sister-in-law Elizabeth, mother of the queen's old favourite, Prince Rupert, had been living in the Hague for some years already. The Hague was a major center for banking and finance; the queen intended to raise funds in aid of her husband there. Henrietta Maria returned to England following the Restoration in October 1660 along with her daughter Henrietta. 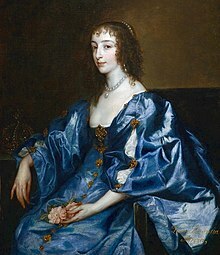 Henrietta Maria's return was partially prompted by a liaison between the Earl of Clarendon's daughter Anne and Henrietta Maria's son, the Duke of York – Anne was pregnant, and the Duke had proposed marrying her. Henrietta Maria still disliked Clarendon, and did not want Anne as a daughter-in-law, but Charles II agreed and despite her efforts the wedding went ahead. Henrietta Maria did not return to much public acclaim – Samuel Pepys counted only three small bonfires lit in her honour,  and described her a "very little plain old woman, and nothing more in her presence in any respect nor garb than any ordinary woman". She took up residence once more at Somerset House, supported by a generous pension. Catherine 29 January 1639 29 January 1639 Died less than half an hour after baptizing;  buried Westminster Abbey. ^ Mike Mahoney. "Henrietta Maria of France". Englishmonarchs.co.uk. Retrieved 2014-08-20.